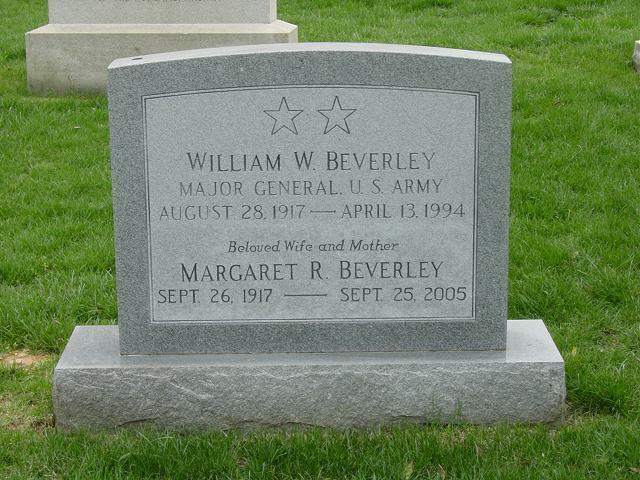 William Beverley, a retired Army Major General died, age 77, April 13, 1994 of pulmonary fibrosis in Winston-Salem, North Carolina. General Beverley was commission a Second Lieutenant of Field Artillery in 1938. When he was a Major and commanded 2 batteries in 73rd Field Arty Battalion, 2nd Cavalry Division. During WWII, he was a Lieutenant Colonel of the 423rd Armored Field Artillery Battalion, 10th Armored Division in Rhineland, Ardennes and Central Europe campaigns. In 1945, he commanded 68th Constabulary Squadron in Germany. He was detailed to Department of the Army General Staff in Washington, D.C. in 1951 and became Chief of Army Section, US Military Assistance Staff, Belgrade, Yugoslavia. He was promoted to Major General in 1954 and became Chief, Office of Personnel Operations. He was then assigned as Chied of Staff, 8th Army in Korea. He Served total of 32 years. Hie medals include the Distinguished Service Medal, the Silver Star, the Legion of Merit, the Bronze Star Medal, the Army Commendation Medal and the Republic of Korea Meritorious Medal. Survivors include wife, Margaret; one son, Colonel William Beverley, Jr; and two grandsons. Burial with full military honors April 20, 1994 in Section 3, Grave 1816-A, at Arlington National Cemetery.